Get Your Limit! Hunting and Fishing in Minot, 2012. - Word on the street with Visit Minot!Word on the street with Visit Minot! 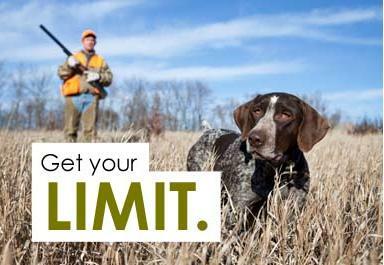 Get Your Limit! Hunting and Fishing in Minot, 2012. Minot and the surrounding area have a reputation among outdoor adventurers that is one of a kind. From world-class walleye and perch fishing to unbeatable upland game, waterfowl and big game. Within an hour’s drive east of Minot, you can find lots of public and private land in fields, forests, and wetlands. Minot is right along one of North America’s primary corridors for waterfowl migration, making this one the nation’s best places to hunt Canada geese and snow geese. Minot has numerous hunting possibilities ranging from upland birds, waterfowl, predators, and even big game animals such as deer and moose. From Lake Darling to Lake Sakakawea, and even Lake Audubon, fisherman have a chance at catching countless species of pan fish, walleye, pike, trout, and salmon. Fishing all the major lakes around Minot offers an excellent opportunity to not only fish for multiple species, but also catch multiple species in one day out on the water — an angler’s dream! Minot is the perfect place to kick up your feet after a perfect day on the lake, or a successful day in the field or on the water. We have plenty of hotels to choose from and you can check their availability right from our website. You can also grab a bite to eat from our growing list of restaurants and if you need some supplies we have perfect places for that too. Scheels All Sports at the Daktota Square Mall and A-Sportsman’s Loft feature all your hunting and fishing supplies and many of the convenience stores around the city offer tackle, bait, and licensing for a quick stop on the way out of town. We look forward to seeing you in the Magic City soon!